Key English Test (KET) Preliminary English Test (PET) What's in the KET? 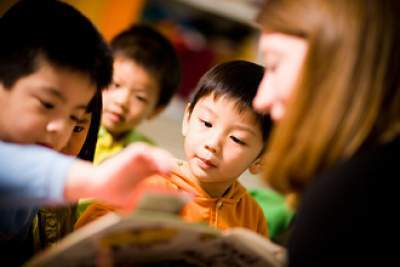 Cambridge ESOL’s Young Learners English (YLE), give a consistent measure of how well 7–12 year-olds are doing in the skills of listening, speaking, reading and writing. These tests are designed to make learning fun and children are encouraged by working towards certificates and earning ‘shields’ that record their progress. Learning English can give your child a valuable head start in life that lead to improved employment opportunities and opening doors to studying and working abroad. The sooner they start learning, the better – with the right methods, they can learn English quickly, effectively and enjoyably. Even the most basic certificate is a start on the pathway to qualifications that are useful for work and study. Cambridge English: Young Learners English (YLE) is a three level program that encourages younger children to work towards three certificates, Starters, Movers and Flyers. 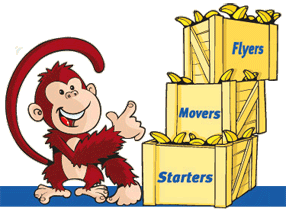 They start by learning simple words and phrases for Starters, and progress to using extended and more challenging language in Movers and Flyers. By using fun engaging materials – and focusing on practical English – children build real language skills that develop into a firm foundation in English. It’s not possible to fail the YLE tests as students are evaluated on their level of English rather than their test performance. One goal is to remove the fear of examinations from your children at an early stage, while motivating them to further develop their English skills. Young Learners English (YLE): Starters, is the first of three Cambridge English: Young Learners tests specifically designed for school children aged between 7 and 12. This exam sets your child off on their language learning adventure, introducing them to everyday written and spoken English in a fun and motivating way. Want to learn more? Click here to see the “Starters” format and to download free sample papers and listening formats. Want to learn more? Click here to see the “Movers” and to download free sample papers and listening formats. 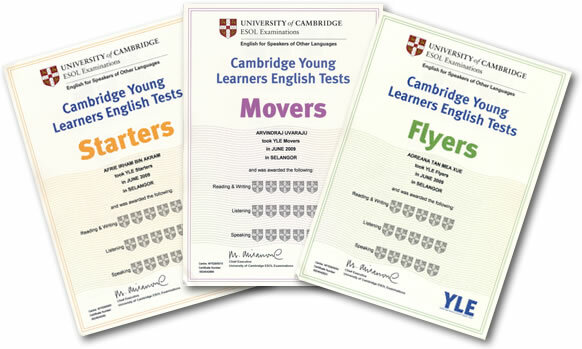 Young Learners English (YLE): Flyers, is the highest of three tests specifically designed for schoolchildren aged between 7 and 12. Cambridge English: Flyers shows a child can deal with everyday written and spoken English at a basic level. Want to learn more? Click here to see the “Flyers” and to download free sample papers and listening formats. Click here to learn about the indivdiual composition of each of the three YLE tests. 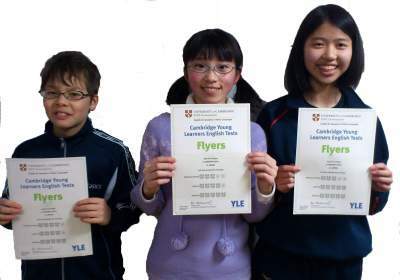 Every child who takes a Cambridge Young Learners English Test gets a Cambridge award, which has a maximum of five shields for each language skill: Listening, Reading and Writing, and Speaking. This shows clearly how your child is progressing and will motivate them to study English more. There are four language skills that we need for complete communication. Though related, each of the four skills — listening, reading, writing and speaking — are distinct and each contributes uniquely to a student’s overall communicative ability. It’s this broader trait of communicative competence — not specific individual skills — that is critical in most academic (and later in workplace settings). That's why it's important to test for each of these four language skills individually because each is a critical aspect of communicative competence. It's typically the speaking skill that doesn't get assessed, which often means it is not specifically taught. This can lead to students who can comprehend English at higher grade levels, but are handicapped in their ability to effectively communicate through speaking. Cambridge English tests are the industry standard in delivering a comprehensive, four skill English language assessment for your students. Cambridge Speaking tests, for example, are conducted by trained, certified examiners. The three videos below show the progression of the Speaking Test as it progresses through the initial YLE level (Starters), through the second level (Movers) and finally to the last level (Flyers). The YLE program takes a child from the 'beginners' A1 level through the A2 'elementary' stage to the door of the B1 'intermediate' level. Have Fun Practicing your English! 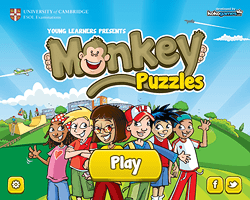 Visit our Monkey's favorite places and play 8 mini games to test your English. Unlock new games as you progress - but watch out, the games get harder as you go along!